I had a bit of roast suckling pig leftover and decided it was too good to go to waste. In our house that means it really has to be used the following night as Tina is very cautious when it comes to leftovers. So much so that if I have to smell some meat or fish to check that its ok I need to make sure she doesn't see me otherwise the jig is up and no amount of convincing will change her mind. I had the odea that I would do a Khao Moo Krob (crispy pork with rice) but I din;t have a recipe and to be honest I got a bit confused and was googling Khao Moo Daeng which is pretty similar but with red pork. So as I didn't have red pork I decided to go with David Thompson's Pad Kana Moo Krob from his Thai Street Food cookbook. At lunch I had an idea I would be cooking the leftover pork so I dropped into Wing Cheong in Chinatown and picked up some morning glory, just a small bunch and it cost 70 cents! DT's recipe uses chinese broccoli which is also a favourite of mine but I decided that the morning glory would do just as good a job. The recipe is pretty simple, which is a nice change from most of the recipes in Thai Street Food. I crushed 1 tablespoon of garlic with some salt. A qucik note on garlic, I used to buy that purple garlic because it looks cool and is really strong and pungent and oozes garlic oiliness. However, these days I just buy the imported chinese garlic as it is less pungent and also much cheaper. I remember reading that the Thai garlic is much smaller and not very strong in flavour so I think the Chinese garlic is better for Thai dishes. After chopping up the roast pork and morning glory I just heated up the wok with some oil til it was nice and hot and threw in the crished garlic and salt for around 30 seconds. After that I added the morning glory and fried it quickly then added the pork, a tablespoon of oyster sauce and a dash of soy sauce. To get it steaming DT says to add a splash of pork stock or water. i used water. I reckon if you are adding oyster and soy sauce then any subtle taste from the pork stock is not going to be missed. I always use the expensive oyster sauce as I think the cheaper one is made of some kind of oyster substitute or extract or something, anyway the premium stuff is just better. 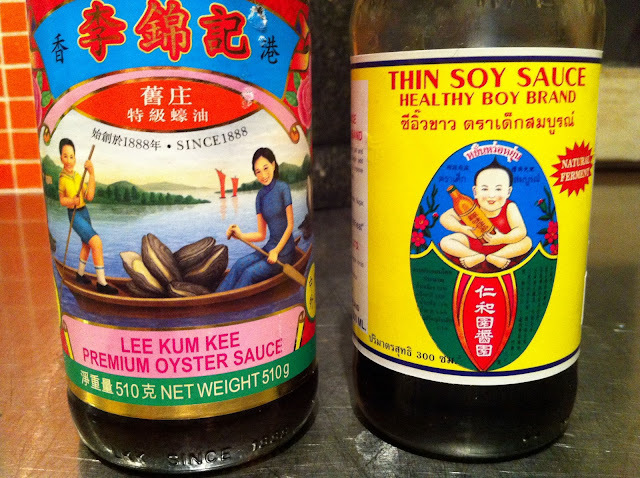 I am using the Healthy Boy Brand thin soy sauce at the moment but I'm not 100% sold on it because I think its a bit salty but it's what I have so I just go a bit lighter with it. 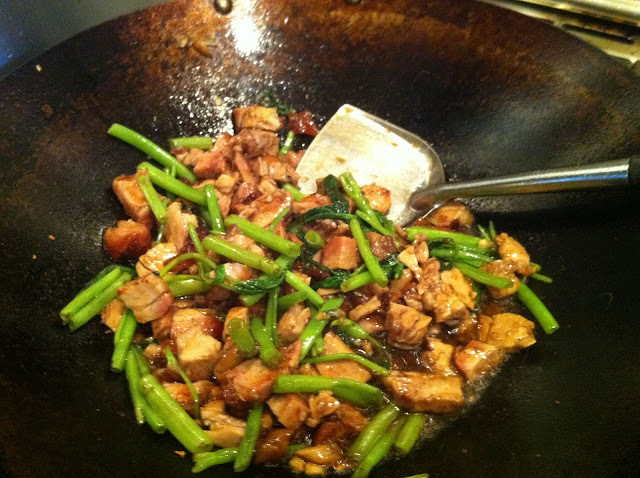 I also added a tablespoon of sugar and stir fried until the pork was heated through and the morning glory was nicely wilted. finally I plated it up with some rice from my trusty rice cooker and it was ready to eat! 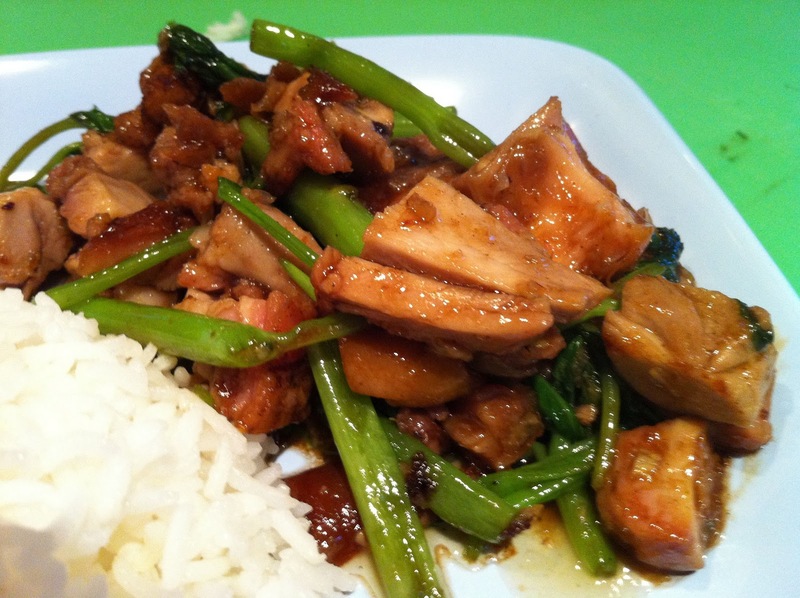 I loved it, its definitely a great way to use leftover roast pork.